This month has been a bit busy and my mind has been going in a different direction. July has been a no spend month. I was very unintentional about it, but the budget demanded it. The budget is going to demand it for August also so no spending unless necessary. The great thing about having a no spend month in the summer is that my garden and everyone else's garden has been exploding with goodness! My garden was being a bit late, but now is producing nicely. I wish the tomatoes were a little more prolific, but I am happy to just have tomatoes turn red this year! My onions are actually growing too! The chickens are all alive and well. I decided to start free ranging them all day. They are usually in their coop by 8:30 pm all on their own. I let them out at 7:00 am to start roaming the yard. I am still feeding them some starter mash with cracked corn added to it, but they are eating less of that and more of the nature provided food. I am working on their nesting boxes and hope to have them up this week. I will do a post about that soon. My clothes dryer quit. I am not in a hurry to replace it right now since it is summer and I hang clothes out most of the time anyway. I am determined to try to fix the dryer myself. Supposedly, clothes dryers are one of the easiest appliances to fix. Supposedly. I will find out! 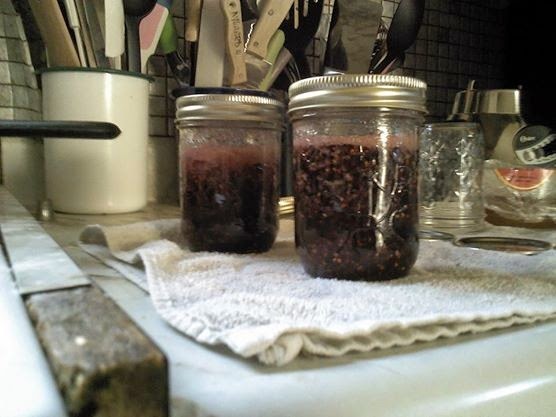 I am working on small batch canning in an effort to not waste produce. We had a good raspberry turnout this year, but not enough made it into the house. I had enough, however, to make a small batch of raspberry jam. I made 2 - 8 oz. jars which will taste delightful this winter. I was given ten pounds of blueberries and ten pounds of sweet cherries. I froze most of the blueberries, but canned four pint jars and one half-pint jar since I had never canned blueberries before. I canned almost all of the cherries and got thirteen pints out of those that I did not eat! As you tell, I am really trying to cut down on the grocery bill. I am working hard to keep the grocery budget at $200. Some months are not going to be as easy as others, but I am trying. We have been making more from scratch. Paige made five batches of chocolate chip cookies to share on her Washington DC trip. I have been making bread and granola as always. I want to learn how to make good crackers next since I miss munching on those once in a while. I have also been taking vegie salads or leftovers to work every day. I only ate out once in the last month for lunch. I made a batch of homemade laundry detergent. I had to fix my big wooden spoon before I started since one of my kids broke it trying to stir a batch of chicken feed. I fixed it with black electrical tape wrapped up and down the handle. I refilled a lot of plastic water bottles and put them into the freezer. They will help keep the freezer running more efficiently since a full freezer runs better. They will also be great to keep school lunches cold when the kids decide they need a cold lunch. They are also great to have on hand if the power goes out and we need additional water or things to stay cold in the freezer. I made candles with supplies I bought a year ago. I was really surprised at how easy they were. Since I have plenty of wick left over, I will be ordering more wax when space opens up in the budget. 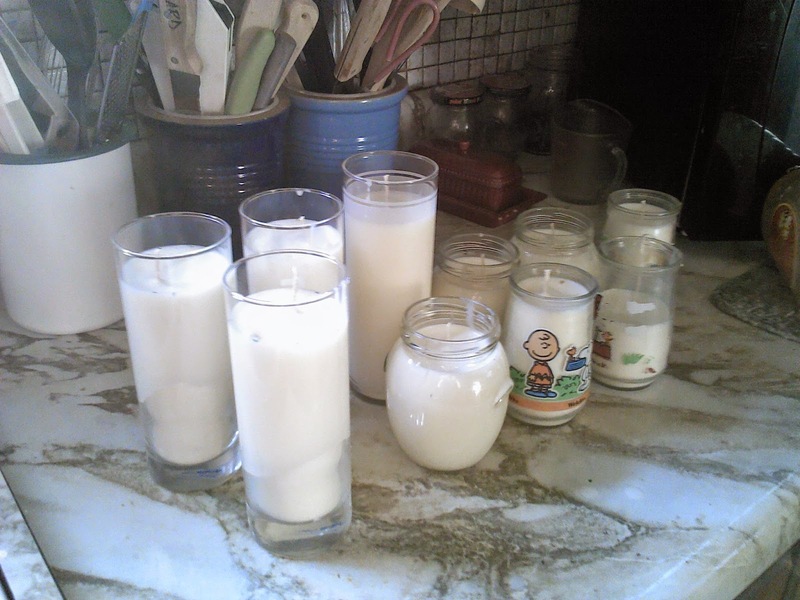 I used glasses for the candles that I had around the house and we did not use anymore. That is the highlights for the month. Of course, we have still been making our own cleaners, mending clothes, and making do as much as possible!